Hoof care challenges have existed since the dawn of dairy farming. The search for ways to deal with them has never stopped. In general, farmers give their dairy cows a foot bath every week. The right and timely execution of this protocol with Intra Hoof-Sol Bath has produced positive results. Still, foot bathing often fails to deliver decent outcomes when farmers use inferior disinfectants such as formalin or copper sulphate. The reasons for failure include faulty positioning of the bath, shallow depth, and untimely solution replacement. Have you ever considered the traffic pattern of your herd while running foot baths? Generally, the cows with healthy hooves go through first. So, the lame ones trail behind and get the dirty solution. In recent years, dairy farmers and hoof trimmers have started looking for better options to manage the hoof health of their herds. Today’s dairy farms have several spraying applications to use instead of foot bathing or in addition to it. The manual low-pressure sprayer is popular. However, specialists have developed automatic hoof sprayers to add to milking robots and use for spraying in milking parlors. The benefit of the spraying protocol is that every cow receives clean, fresh product regardless of her position in the traffic line. 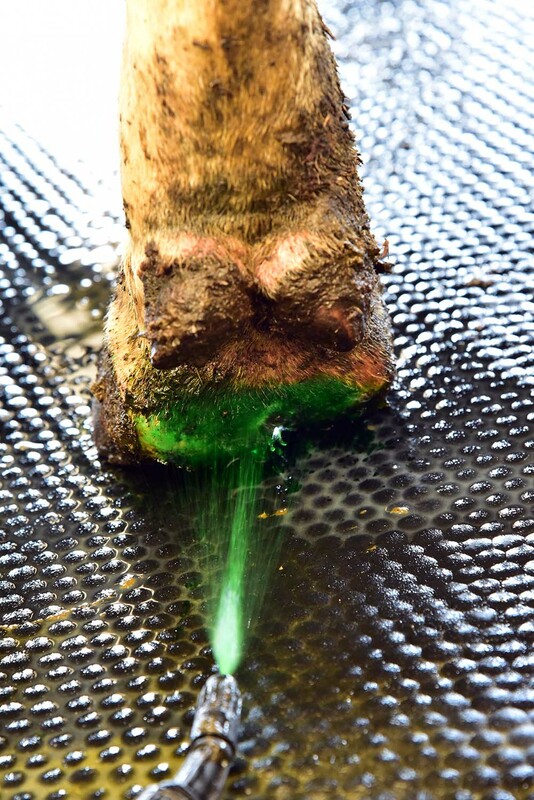 These developments plus the farmers’ need to prevent waste and ensure a long-lasting effect created the basic conditions for work to begin on the formulation of Intra Hoof-Sol Spray. With the support of distributors and hoof experts, the Intracare R&D team managed to deliver something unique. A strong “pearl-network” keeps the proven Intra Hoof-Sol active ingredients homogeneous in solution. Also, this network ensures the product sticks firmly to the hoof. Spot-spraying provides long contact time at a lower dosage per hoof compared to the foot bath method. Intra Hoof-Sol Spray comes as a ready-to-use solution and has excellent adhesion even to wet skin or hoof. Thus, it reduces the waste resulting from run-off on the floor. After its successful launch, Intra Hoof-Sol Spray has enjoyed wide use on farms in Europe and North America. Testing goes on in all mentioned spraying systems under several seasonal conditions. Since May 2018, Intra Hoof-Sol Spray has debuted in 10 countries with great success. Cows with lameness issues need special care and attention. We recommend using a professional hoof trimmer to treat your animals before you implement spraying and/or foot bathing protocols. Intracare advises starting with individual treatment with Intra Hoof-fit Gel in the hoof trimming chute. When adding the prevention protocol, we recommend using Intra Hoof-Sol Spray twice weekly for four weeks. After that, you can continue with one application per week. Intra Hoof-Sol Spray has approval for use in organic farming and is gentle on the hooves. It will fulfill the needs of many farmers for several reasons. Firstly, it has proven efficacy and safety and is easy to use. Secondly, it ensures the absence of contamination between cows and minimal run-off on the floor. Finally, it has good flowability in all types of sprayers. If you have any questions about this unique product, do not hesitate to contact us! The Intra Hoof-Sol Spray product flyer is available as a PDF download. Watch the product demonstration below.